On a recent visit to Melbourne, I joined a group of Chief Marketing Officers from some of Australia's most prestigious law firms for dinner and a lively discussion about the state of the legal marketplace. CMOs often find themselves in a curious position, and certainly one size does not fit all. Many have broad c-suite experience and deep marketing expertise developed in other industries where their wise counsel is not only sought but heeded. In law firms, however, the marketing function and the CMO may be relegated to a tactical function required to be on call to support the latest whims of the partners who generally have good intentions but often make poor choices about how to allocate marketing resources. Other CMOs have long experience within law firms and know how to get things done, but long for investments in cutting edge tactics that they observe in other industries. And still others are firmly entrenched in the law firm c-suite, participating in and bringing the voice of marketing, and, by extension, the voice of the client, into all strategic decisions. There are three factors that law firms should be focused on: client satisfaction, the quality of their work product and their financial performance. The traditional focus on the billable hour is a red herring. Focus on the clients and the work product, and the revenues and profits will follow. Law firms need to better ‘productise’ their offerings, recognising that in every law firm there are offerings at the top of the market and others at the bottom. 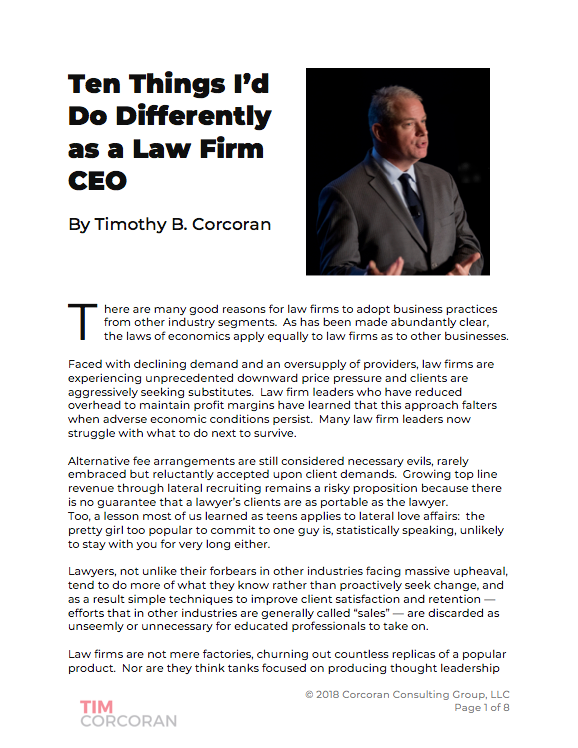 Few law firms operate in only one segment of the market, yet the typical pricing and staffing models don't reflect the diversity of the product mix. Clients are delighted with the ongoing changes in the legal marketplace. They’re getting more for less, they’re getting more quality, they’re getting more predictability in their budgets. Rather than seek clients who aren't interested in change, law firms should focus on how to incorporate the client's changing needs into their operations. Law firms have a curious approach to making money, where the reward for a young lawyer working very hard is to become a partner who must now work even harder. Because younger lawyers increasingly reject this path, older partners think they lack a work ethic. Not at all. In fact, millennial lawyers are taking a lesson from other businesses and seeking to create a business model that doesn’t rely solely on more effort to generate more income. Diversity is important, businesses are saying “We believe in diversity of our people in gender, religion, geography and sexual orientation because it creates a diversity of thought that helps us be adaptable, helps us be innovative as a business, helps us adapt to different cultures and helps us sell more”. It’s mandatory. You can read the rest of the article here. Enjoy! Timothy B. Corcoran is principal of Corcoran Consulting Group, based in New York with a global client base. He’s a Trustee and Fellow of the College of Law Practice Management, and was 2014 president of the Legal Marketing Association. A former CEO, Tim guides law firm and law department leaders through the profitable disruption of outdated business models. A sought-after speaker and writer, he also authors Corcoran’s Business of Law blog. Tim can be reached at Tim@BringInTim.com and +1.609.557.7311.